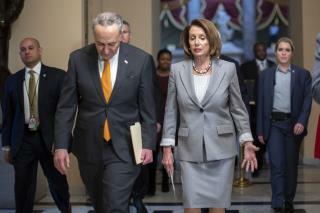 (Newser) – President Trump reportedly walked out of a meeting with Nancy Pelosi and Chuck Schumer Wednesday after Pelosi said she would not agree to fund his desired border wall, top Democrats tell the AP. Schumer says Trump asked the question, and when Pelosi said no, the POTUS responded, "Then we have nothing to discuss." Then, "he just walked out," Schumer says. Trump also addressed the situation on Twitter, the Hill reports. His take: "Just left a meeting with Chuck and Nancy, a total waste of time. I asked what is going to happen in 30 days if I quickly open things up, are you going to approve Border Security which includes a Wall or Steel Barrier? Nancy said, NO. I said bye-bye, nothing else works!" My son has had this horrible smelling gas the last two days. I think Nancy had it at the meeting and Trump took the polite Trump way out. The old bag needs to get her wrinkles fixed and not get anymore tanning. Enough is enough!